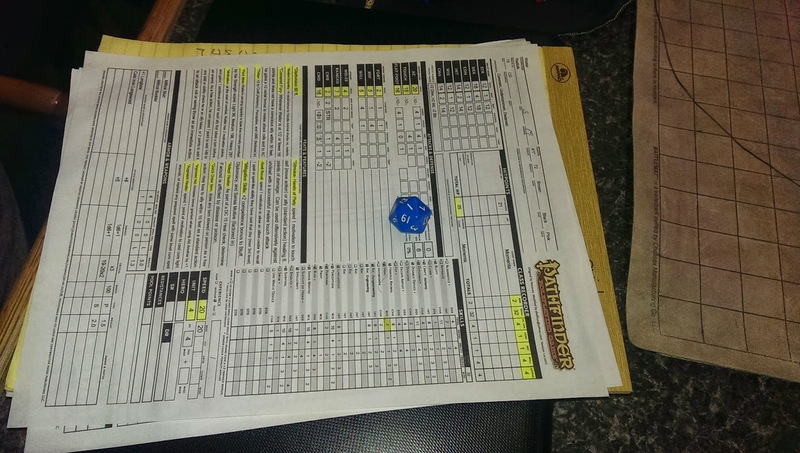 Somnambulant Gamer: 3ppT Recap: 4/2/15... or "3ppT's 1st TPK"
3ppT Recap: 4/2/15... or "3ppT's 1st TPK"
So, we actually had a big night! 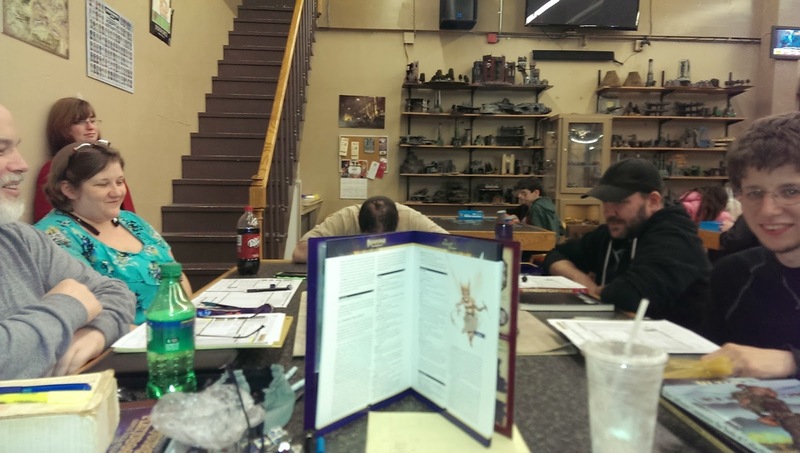 In addition to our four returning players, we had two new players join the table and a couple voyeurs interested in playing but without the time to join that particular session. We may be opening up a second table soon! As you may recall from our last article, the party was tackling Sam Zeitlin's "The Midnight Mirror". Avarlene, Thurlavald, Morek, and Watler had just discovered that the source of the town's disappearances was an evil fey known as a lurker in light who claimed to be working for the baron. When last we left them, Morek had just been blinded by the lurker, named Ilquis, and a pair of stumbling townsfolk were lurching forward to attack the party. I took this opportunity to work in the first of our new players, and who should awaken neck deep in a pot of cooled wax then our old pal, Gruff Grimbeard, the dwarven Shadow Assassin! While Gruff began trying to extricate himself from his sticky predicament, the party worked to subdue the entranced townsfolk while Watler squared off with Ilquis. The plucky little ratman may not have been the swordsman in the land, but his cold iron blade gave Ilquis something to think about! The townsfolk were quickly subdued and the rest of the group closed in on the evil fey, though he didn't make it easy on them (and neither did their dice!). The group eventually defeated the lurker in light, swatting him down as he tried to flee to safety after taking a particularly telling blow. After extricating young Olya and the other townsfolk from their waxen prisons, the party recruited Gruff Grimbeard into their number and set off to the temple of Zon-Kuthon for some healing and information gathering. Along the way there, they encountered a dour half-orc escorting his sister, a young woman afflicted by an advanced case of the tallowthroat disease. Before the party's horrified eyes, the woman's throat burst apart in a spray of blood and gore, and two horrific shadows clawed free of her body! 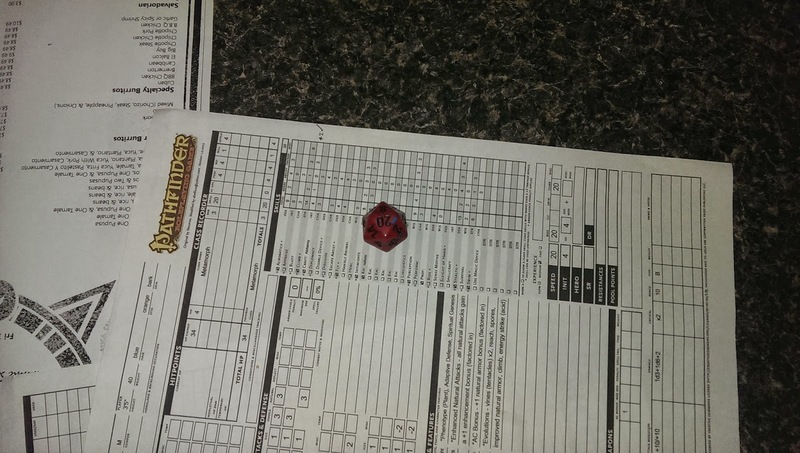 Wasting no time, the party joined the berserk half-orc in avenging his sister and destroying the shadows. The half-orc, a Warloghe named Garn Blackhand, accompanied the party to the temple in search of answers and from there, joined them as they left to confront the baron. With the townsfolk viewing the party as heroes after the rescue of Olya and the others from the evil fey, and the fetchling population indebted to them for their rescue of the fetchling farmers from an enraged lynch mob, the baron found himself with few allies as the party stormed his mansion demanding answers as to why the baron would condone the lurker's activities and the source of the tallowthroat plague. With nowhere left to run, the baron finally revealed the truth: years before, he had made a pact with a powerful being of shadow, a shae, imprisoned within a magical mirror belw the keep. In exchange for allowing the shae the use of his body to escape its prison once every 10 years, the shae helped the baron murder his father and older brothers to take rulership of the barony. With his new wife and son, the baron became unwilling to honor his pledge to the dark creature, and its wrath gave birth to the tallowthroat plague. The lurker in light was an ally the baron had recruited, not realizing when he did so that his instructions to the fey to "do whatever it takes to keep the barony safe from the forces in shadow" would be taken as implicit authorization for ritual sacrifice. The party ultimately decided to defend the barony from its ruler's foolishness, and traveled through the Midnight Mirror and into the shadowy prison plane it contained, a dark mirror of the baron's own estate, to slay the evil shae and destroy the mirror itself. And that's pretty much that. It was definitely sad to see the heroes fall, but as we all know, the good guys don't always win. For the 4/9 game, due to delays that are entirely my fault, we won't be able to run Dance Macabre from Four Dollar Dungeons alongside our characters from Ascension Games' Path of Shadows and Legendary Games' Gothic Campaign Compendium as planned, so instead we'll be saving those for our return in May. Tonight's game will instead be the 1st level adventure Murder's Mark by Jim Groves, with characters from Northwinter Press' Mystical: Kingdom of Monsters. I've reviewed M:KoM at the Paizo site linked to just prior to this, and I highly encourage everyone to check it out. I'll be leaving for my wedding and honeymoon in the Caribbean this weekend, so 3ppT will be on a 2-3 week hiatus until my return. Talk to you then!